Before I start talking about railfanning, and photography, I want to talk about the real reason this trip came about: food. I frequently talk about it, but one of the best things about going out railfanning is getting the chance to go “sample the local cuisine”. 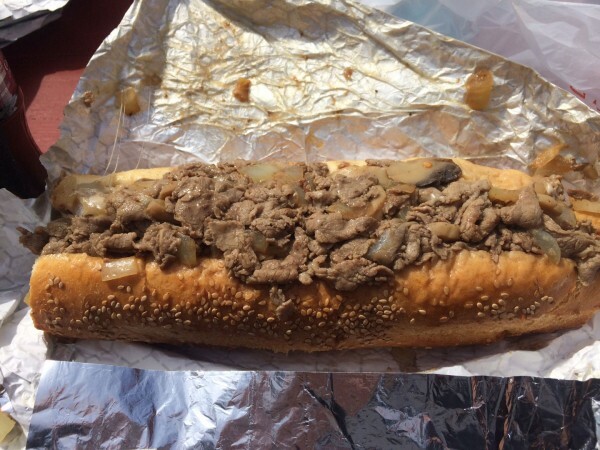 Sometimes this is a dive bar on the side of a mountain, sometimes it’s just a Sheetz, and sometimes (for example, this time), it’s visiting the place that makes life-changing cheesesteaks: John’s Roast Pork. My raving about the place has made a number of my friends want to go there, and so getting a chance to do that has been on our list of priorities. That was first and foremost in our planning for the day. Additionally, there were discussions about various aspects of the city that have piqued peoples interests, and so, when the opportunity presented itself, we got together, and headed for the city of brotherly love. Our first stop of the day was on the CSX Philly Sub, where the long-lived B&O color position light (CPL) signals have been rapidly disappearing. The Collingdale signal has been a holdout, and since it was near our base of operations for the day (my parents house), it was our first stop. 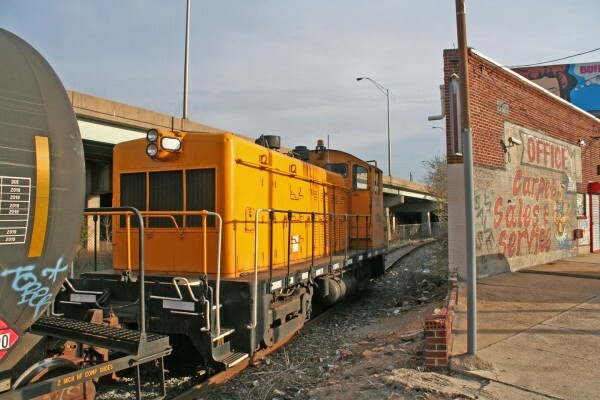 Railfanning Philadelphia can be a real challenge, because, unlike some other cities, the rail infrastructure is somewhat spread out, and there isn’t a single “mainline” that you can post up on and be guaranteed of seeing something. In fact, trying to catch a train at a specific location takes a combination of hunting skill, patience, and luck. For the Collingdale CPL shot, our plan was to wait at a nearby crossing (where there was a railfan friendly parking lot) until we heard the Q406 (that we had heard approaching from the west) calling the nearby signals (East and West Feltonvilles, Chester and Holmes), at which point we would head for an overpass that gave us a great shot of the signals and the eastbound train. I had done this shot before back in December, and wanted another go at it. 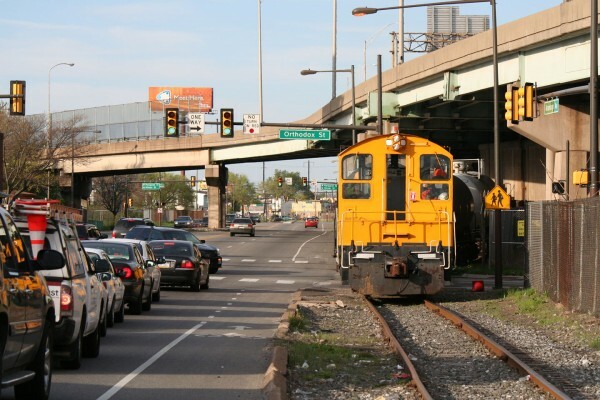 Like I said, though, railfanning in Philly requires luck, and our collective karma did us no favors. We didn’t hear Q406 calling signals (perhaps because some brave railroad employee decided to play some Katy Perry over the radio), and when we first spotted him, he was less than a quarter mile away: way too close to reposition to the overpass. So, instead of getting the CPLs in the shot, we got this view. 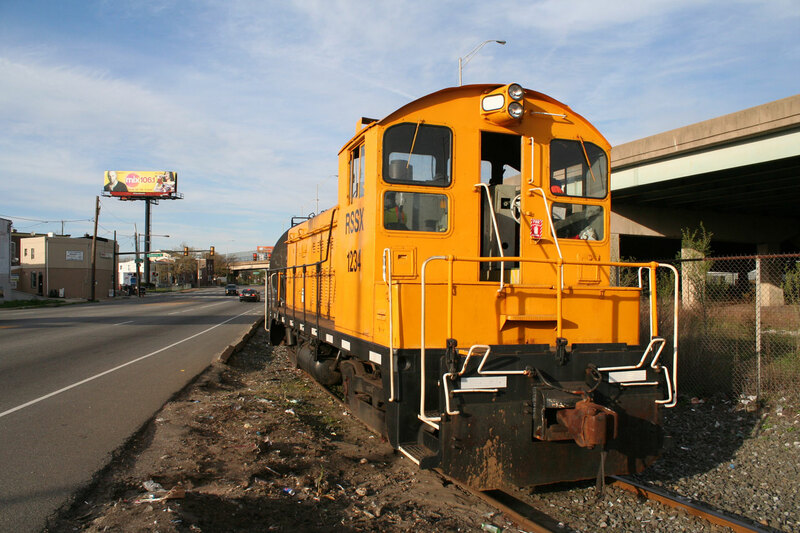 Q406-25 at Oak Avenue on the CSX Philly sub. And here he is, going away, with the CPLs we were interested in. You can see the new Safetran installation already in place, and also one of the reasons they’re going away: the burned out bulb and malfunction (displaying a stop signal, even though the line was clear). Q406 gets ready to pass the malfunctioning Collingdale CPL signal (and its impending replacement). 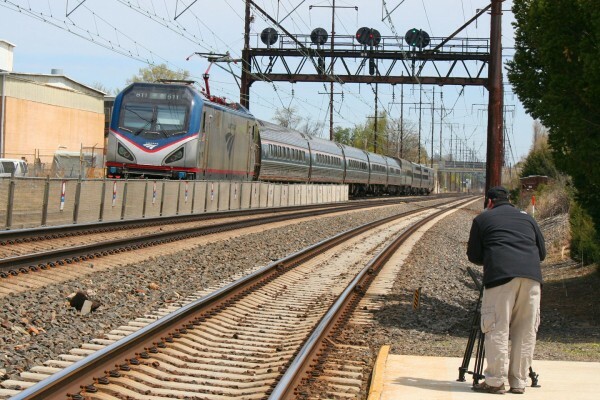 My friend Chris is slowly working on getting footage for a video on Amtrak’s Northeast Corridor. This means that, when we have a chance to check out Amtrak stuff, we do. Philly has a good bit of it, so our next stop was the SEPTA station at Prospect Park / Moore station near where I grew up. 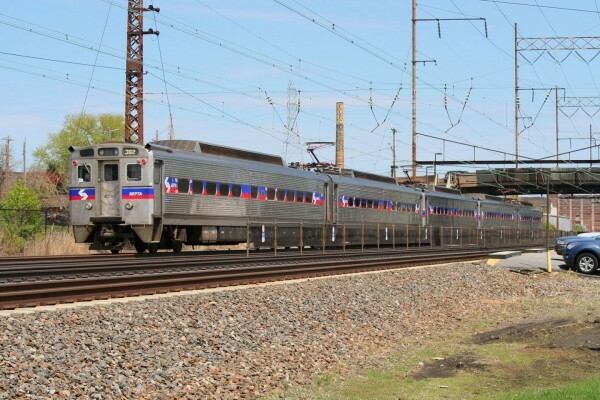 A train of SEPTA Silverliner IVs stops at Prospect Park on its way into Philadelphia. Silverliner IV 365 departs Prospect Park for center city. You see some odd things around the tracks. 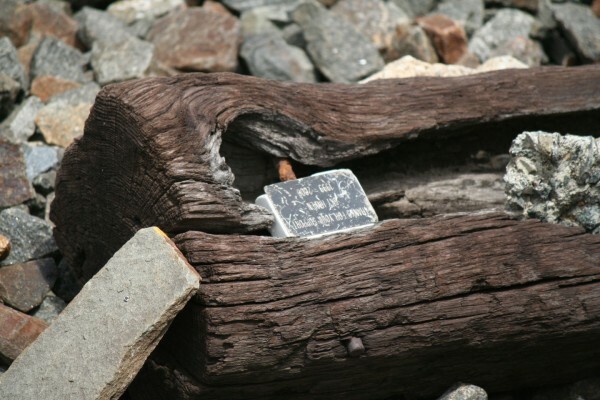 The plaque on this destroyed piece of wood reads reads “Thanks For Your Support – Sky Haven – 1999-2000”. Prospect Park also sports Amtrak action. 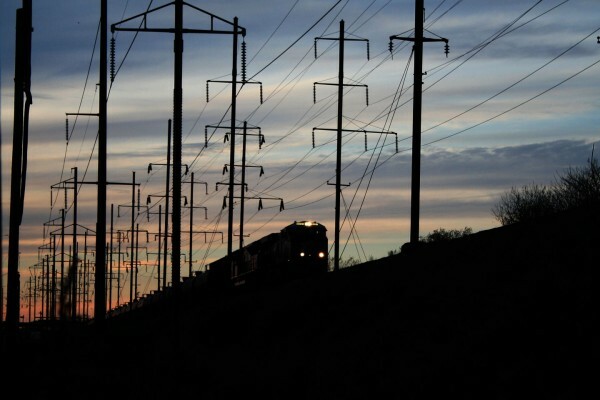 There’s plenty of warning for approaching southbound trains, but the only way you’ll know about something heading north is the singing in the rails. 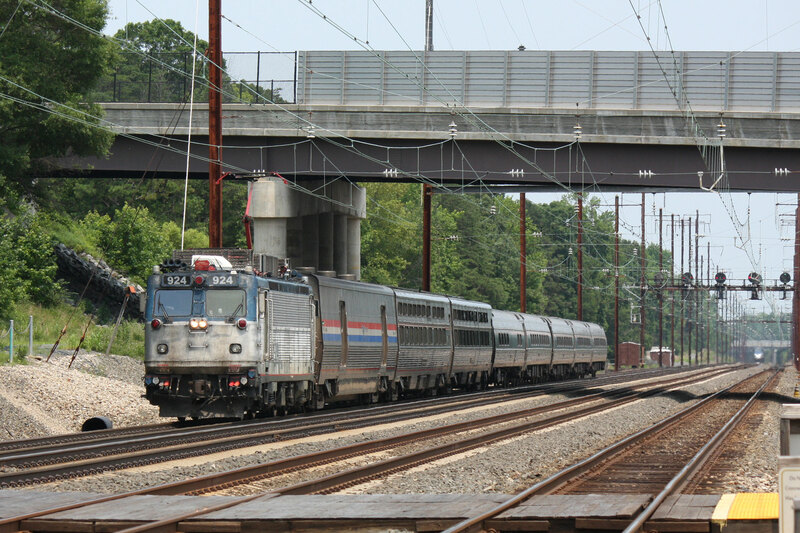 Amtrak AEM7 923 blows through Prospect Park at track speed with a Northeast Regional train. There’s a signal bridge that’s a good photo prop, but the fence designed to keep people from crossing the tracks somewhat ruins shots of trains heading south taken from the inbound platform. Southbound ACS64 611 just knocked down the signals at the east end of the station. We then proceeded further south for a spin through Eddystone, where the old Baldwin plant was, and eventually a stop at Marcus Hook. The Marcus Hook SEPTA station is in a pretty industrialized area surrounded by old factories and chemical refineries. It’s interesting in the day, but even better at night. 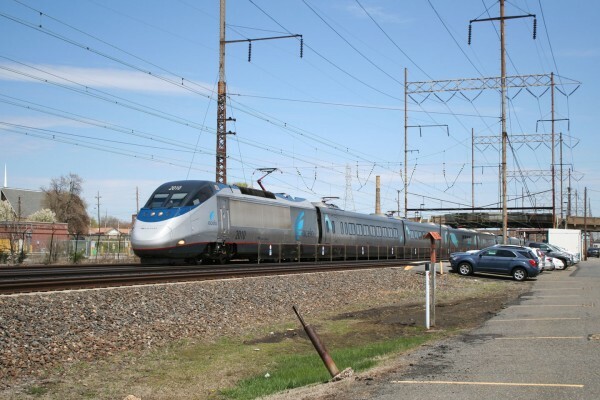 A southbound Acela blows past a stopped set of SEPTA Silverliner IVs at the Marcus Hook station. 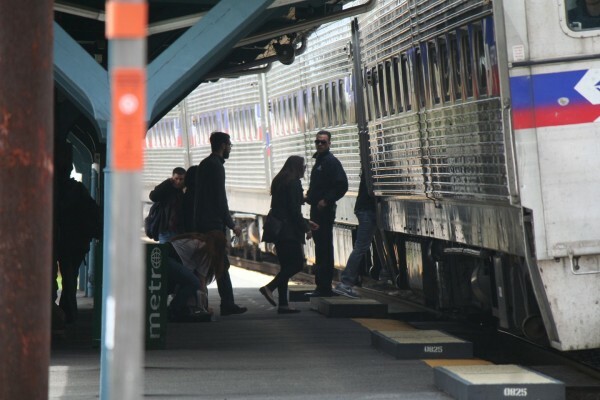 Marcus Hook is also the last stop for some SEPTA trains heading south on the NEC. 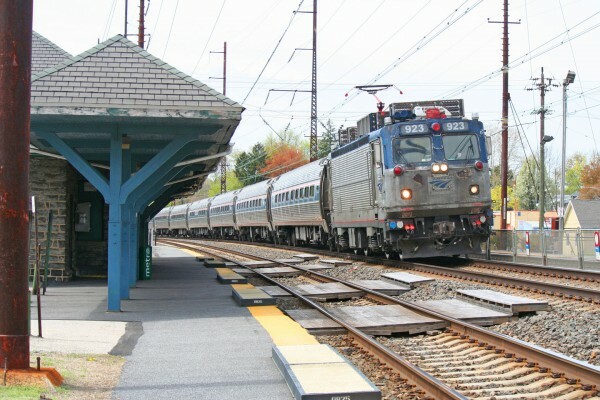 Service continues to Wilmington DE and occasionally Newark, but only during peak times. That results in SEPTA cars laying over here between runs, which is why this set had their marker lights on, even though they were on the “wrong main”. 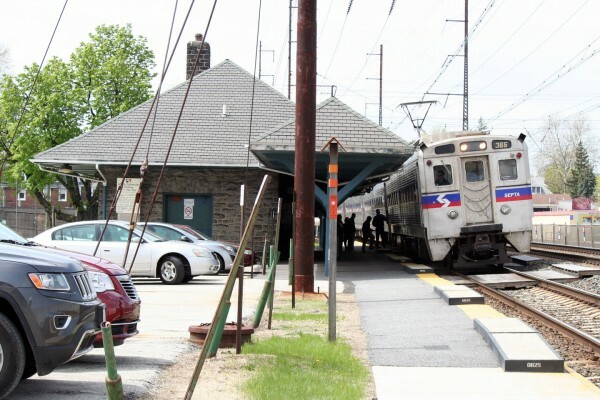 SEPTA MU cars lay over at the end of their run, before heading back into Philadelphia. 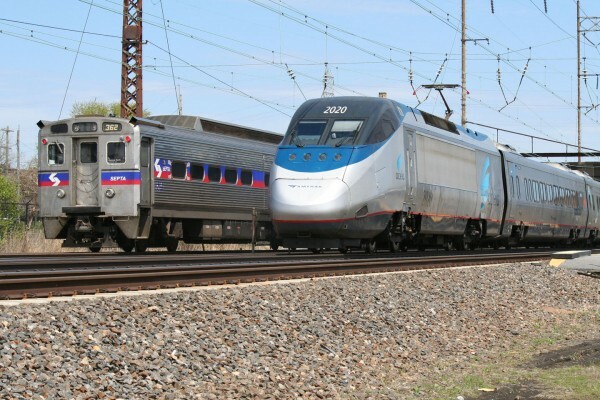 Just as we were getting ready to leave, another Acela showed up. He was moving pretty good through here too. We then set our sights on lunch. As the one group took off up 95, I decided to take Chris the “scenic route” through Chester, and along the Chester Secondary. 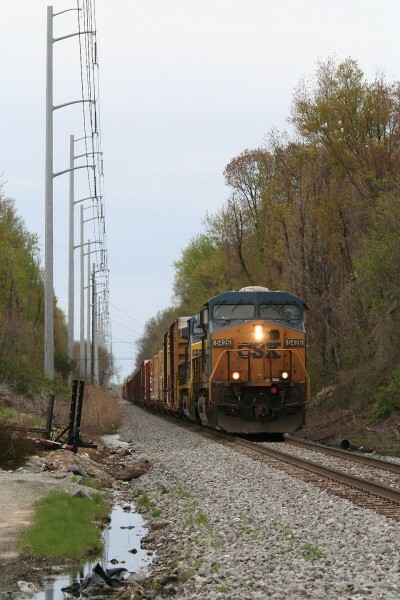 I’m glad we did, because as we were going up PA-291, we spotted a CSX train heading south toward Stoney Creek Yard. A quick u-turn and some short traffic lights (and the almost empty neighborhoods) got us ahead of him. 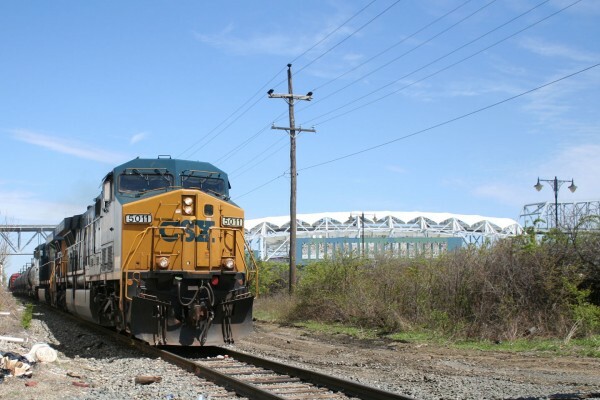 A CSX powered train near PPL Park, where the Philadelphia Union plays. It wasn’t the shot I really wanted, but sometimes, you just gotta shoot from the hip. I still don’t know who this guy was: but I’m guessing it was a CSX transfer to Stoney Creek Yard from Greenwich yard, but I’m not 100% sure. After bagging him, it was off to lunch, as I mentioned, the real reason we came to Philly. Here’s the main attraction, a provolone, onions and mushrooms cheesesteak from THE best cheesesteak place, hands down. There is an important change at JRP too: they’ve extended their hours until 7pm Mon-Sat, so you’re no longer stuck if you can’t get there for lunch. After lunch, feeling tubbed up and unmotivated, we slowly made our way toward the street trackage in Columbus Blvd (it still seems odd not calling it Delaware Ave, despite the change happening over 20 years ago). 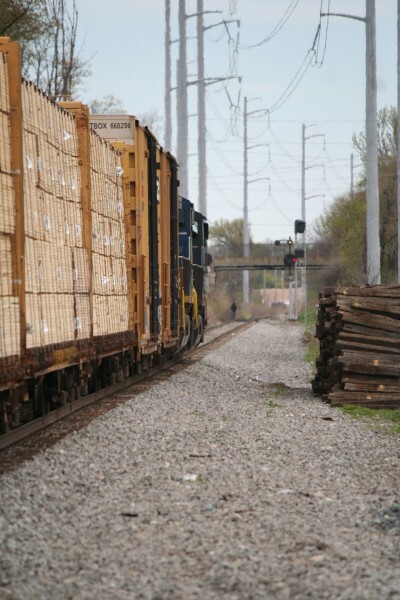 We caught nothing moving, and it was very obvious that CSX’s intermodal terminal was shut down because there was a 53′ container and chassis parked completely across the driveway. For those of you interested in what used to go on there, I found a great Youtube video a few days after our trip that focused on CP Rail’s (now gone) operations in the area. I wish I had shot it, but it came from Rich “fmnut” Frey. We then proceeded further north to Canal St, where there is street running that has to be seen to be believed. I’ve got some photos of it, but I’ll save those for a separate post. 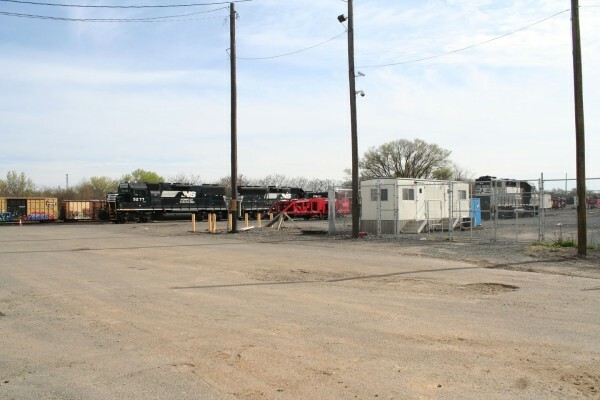 We visited the Conrail Ann St. facility, where power for the Port Richmond area usually lays over, and discovered the city’s construction efforts around Richmond St. This included rebuilding a bunch of trolley tracks, bridge replacement, and rebuilding the road itself. 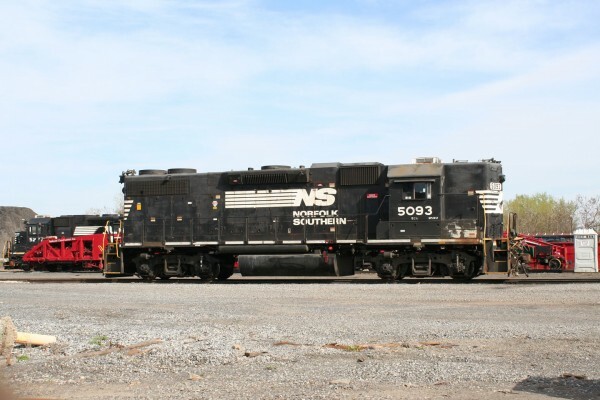 NS 5093 sits in the Ann St. Yard. The view at Ann St. The fenced off area on the right was empty last time I visited, and now holds equipment for the Richmond St construction. Continuing northward, we swung by the approach to the Delair Bridge and Frankford Junction, future site of an Amtrak wreck. Nothing was going on in either of those locations, so I decided to take the crew on a quick sight-seeing tour of my childhood that ended up in us catching the Railserve switcher working the Honeywell plant that’s up the street from my childhood home. Blocking off traffic at Orthodox St for just one more moment, Railserve NW2 1234 shoves a cut of tank cars along Aramingo Ave and into the Honeywell Plant. I’ve got a few more photos, and a much more detailed account of the encounter here. After bagging the Honeywell job, we heard some chatter on the scanner about someone coming east toward Camden. We waited in a nearby Wawa parking lot, with a good view of the tracks, until we saw our quarry, at which point we took off for the Delair approach again. 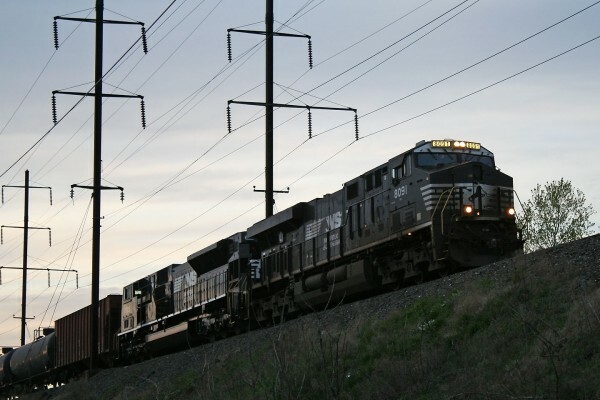 Shooting into the sunset yielded this spectacular photo of a loaded oil train headed to the refineries of South Jersey. 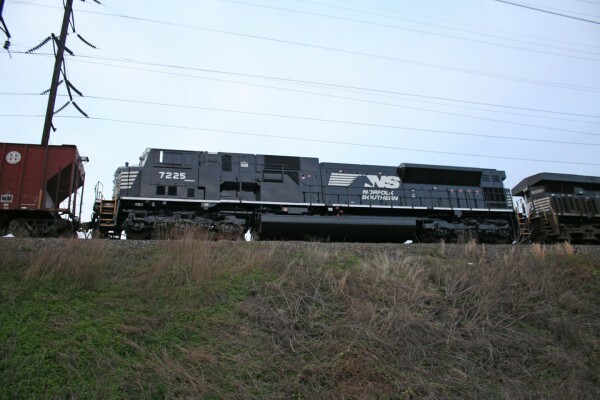 The first unit was a boring GEVO, but the second was one of NS’s newly acquired (from CSX) SD80macs. This one still had its marker lamps, which would disappear just a few days later. Catching an 80mac was a good ending to a great trip. 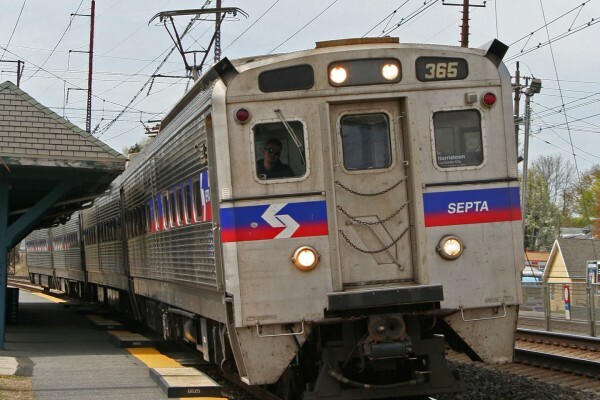 Like most times in Philly, we saw a bunch of cool stuff, but not a whole lot of trains.